Flew Dulles (IAD) to Denver (DEN). 2,330 km on United Airlines in 3h, 51m. Flew Denver (DEN) to Dulles (IAD). 2,330 km on United Airlines in 3h, 08m. Erika and I finally made it official and got married this year. We were legally married on July 5th (at the courthouse), and then we celebrated with friends and family properly on July 7th. Here are some pics from the week. We invited people from out of town over to our house for a casual BBQ on Friday the 6th. Since a huge portion of the people attending the wedding were from out of town, it ended up being a pretty big affair, but it was fun. I was running around like a madman, so I mostly forgot to take photos. Here are a couple though. Before our main reception, Erika and I spent some time with our photographer in our neighborhood to get some pictures. The neighborhood is Five Points, and this particular area is referred to as River North, or RiNo. There’s a bunch of really cool street art, and we wanted to feature that in our photos. I think they turned out pretty excellent. On Saturday we held “the main event”. We rented to rooftop of the coworking office where I work from sometimes, which has a great view over Denver and the Rockies. 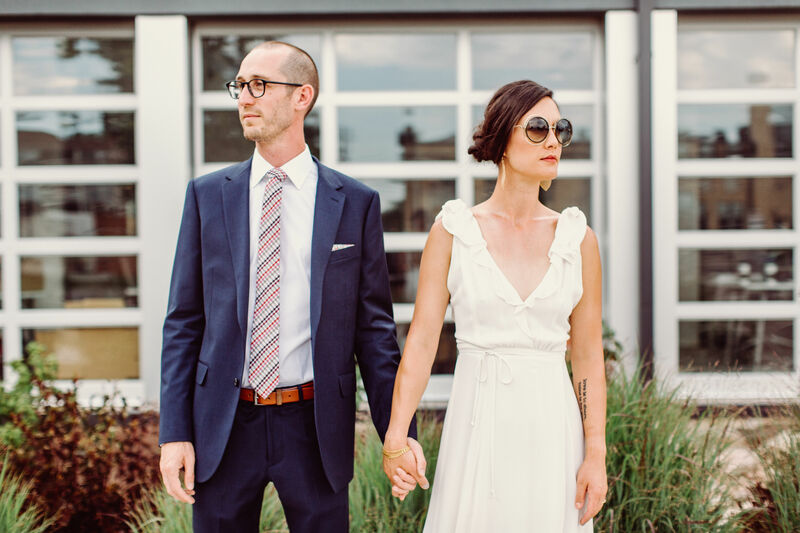 We had some drama between gale force winds, sudden and heavy rain, lightning, a 911 call when the band got stuck in the elevator, and having to rescue the photo booth tent out of a tree… but we stuck it out and once things calmed down it all turned out great. We had a great time, people ate, drank, danced and chatted, and generally it was a good night. It was stressful, it was exhausting, and hey, it was pretty expensive, but it was worth it. We had a really good time, it was excellent to see everyone, and now we’re married. We’ve got some stories to tell.